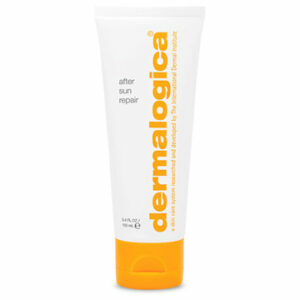 Dermalogica After Sun Repair – A cooling treatment balm to help remedy damage from exposure to UV sunlight. This lightweight gel helps calm skin and minimize irritation caused by sunburn. Directions: Apply a generous amount over previously sun-exposed areas of the face and body. Keep product away from the eyes. 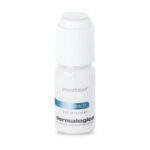 Repeat application on sensitized areas, as necessary, for maximum skin comfort. Ingredients: Water/Aqua/Eau, Butylene Glycol, Glycereth-7 Triacetate, Cyclopentasiloxane, Lavandula Angustifolia (Lavender) Extract, Dipotassium Glycyrrhizate, Sodium Hyaluronate, Alnus Firmifolia Fruit Extract, Hydrolyzed Algin, Algae Extract, Zanthoxylum Alatum Extract, Eugenia Caryophyllus (Clove) Flower Extract, Yucca Schidigera Extract, Cucumis Sativus (Cucumber) Fruit Extract, Chamomilla Recutita (Matricaria) Extract, Camellia Oleifera Leaf Extract, Artemisia Vulgaris Extract, Aniba Rosaeodora (Rosewood) Wood Oil, PEG-40 Hydrogenated Castor Oil, Aloe Barbadensis Leaf Juice, Allantoin, Glycolipids, Magnesium Sulfate, Manganese Sulfate, Benzophenone-4, Disodium EDTA, Dimethiconol, Carbomer, Aminomethyl Propanol, Calcium Aluminum Borosilicate, Citronellol, Geranium Maculatum Oil, Phenoxyethanol, Cedrus Atlantica Bark Oil, Linalool, Geraniol, Rose Flower Oil, Cymbopogon Martini Oil, Cymbopogon Schoenanthus Oil, Dipterocarpus Turbinatus Wood Oil, Methylparaben, Propylparaben.